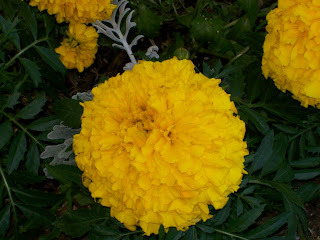 I love marigolds. There's just something about their bright colors and full blooms that makes me happy. 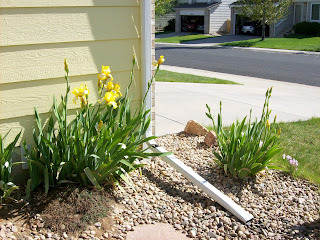 And the yellow iris' on the south side of the house are a bit out of control this year - I may have to thin them in the fall. Okay, who am I kidding? I won't thin them until they approach Audrey-like proportions and attempt to swallow a neighborhood child. 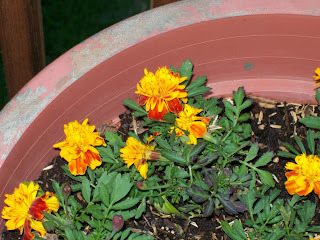 I've always loved marigolds too, cheerful little bursts of color. They not only reseed themselves if you let them, they also work as a natural bug repellent if planted with your tomato plants! And your iris patch is amazing. 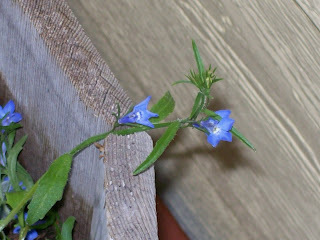 I miss having a flower bed, some varieties just don't adapt well for balcony/apartment living or container gardening. Although I did manage to turn out a 5' tall coleus a few years ago that was quite spectaculur and took over half the balcony it was on! I don't like marigolds. Can't stand the smell of 'em. But your irises are lovely!